Smart cities as urban innovation and transformation initiatives aim to harness physical infrastructures, information communication technologies (ICT), knowledge resources and social infrastructure for economic regeneration, social cohesion, better city administration, and infrastructure management. After the first wave of flagship smart city initiatives in different parts of the world, significant experiences and knowledge are accruing on strategies, challenges, and factors for successful design and implementation of smart cities. However, this knowledge is yet to be systematically analyzed and consolidated into a form suitable for policy makers, practitioners, and other smart city stakeholders. To address this gap, this chapter presents a “Smart City Initiative Design (SCID) framework” produced as one of the outcomes of an extensive study of ten major smart city initiatives through a design science research process. The framework provides common and recurring design objectives for smart city initiatives, core strategies for major dimensions, enabling factors for successful initiatives, and core challenges to be addressed. The SCID framework is intended to be a concrete design instrument for policy makers and practitioners and concomitantly a rich source of propositions for researchers for validations in emerging smart cities. IBM. (2013). Smart Cities. 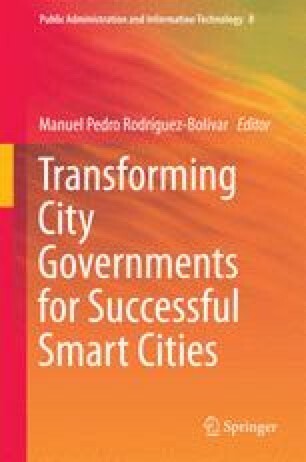 http://www.ibm.com/smarterplanet/us/en/smarter_cities/overview/index.html. Accessed 12 Nov 2013. Living PlanIT. (2011). Living PlanIT at Cisco C-scape. http://www.cisco.com/web/about/ac78/docs/Living_PlanIT_SA_Handouts_C-scape.pdf. Mahizhnan, A. (1999). Smart Cities: The Singapore case. Cities, 16(1), 13–18. http://www.spp.nus.edu.sg/ips/docs/pub/pa_Arun_SmartCities The Singapore Case_99.pdf. Accessed 8 July 2014. Malmo City Environment Department. (2009). Environmental programme for the city of Malmo 2009–2020. City. Malmo. www.malmo.se/miljoprogram. Accessed 8 July 2014. Masdar City. (2011). Exploring Masdar City (pp. 1–93). Masdar. https://www.thefuturebuild.com/assets/images/uploads/static/1745/masdar_city_exploring1.pdf. SmartCity. (2014). SmartCity Malta. Ricalsoli, Malta. http://malta.smartcity.ae/. Accessed 8 July 2014.